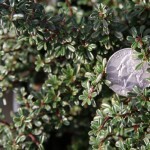 A small, spreading shrub with small red berries following tiny white flowers. The foliage is very tiny, dark glossy green on top, with gray hairs below. A unique and tough groundcover. Prefers full sun and will tolerate some drought once established. The tiny scale of this plant makes it ideal for rock gardens, bonsai, or train gardens.